The summer’s third big traverse is the ski from Camp 10 to Camp 18. As a former JIRPer returning as staff member, I have knowledge of the magnificence of Camp 18, which is what kept me going during the 18 mile ski from Camp 10, whereas the students only had my description of the splendor of Camp 18 to ponder as we skied. 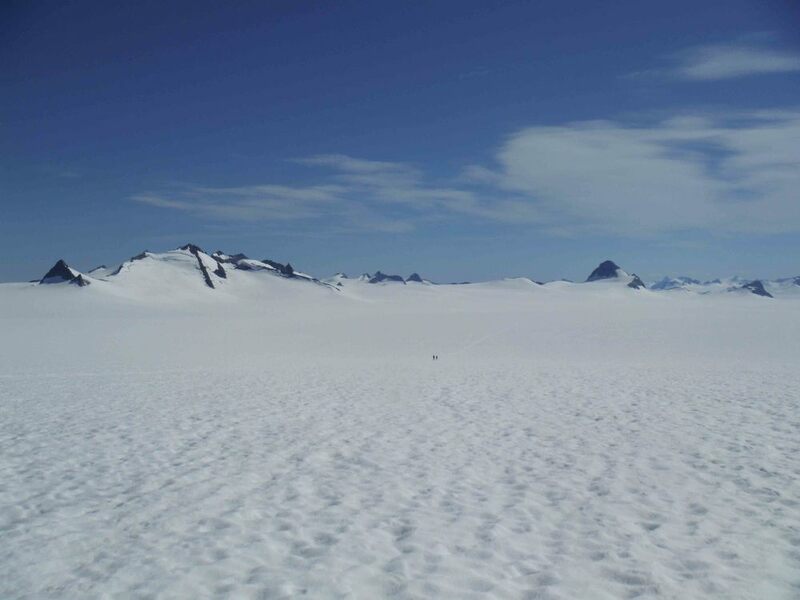 The excitement of seeing the vast icy expanse on a gorgeous summer day made the journey as rewarding as the destination. In the days leading up to the traverse, it was unfortunate that we could not see the Taku Towers - the iconic landmarks of Camp 10. Luckily, the weather cleared on the day that our group left for Camp 18. The first few hundred feet of the 18 mile day consisted of a steep downhill pitch covered in suncups, which always takes awhile to navigate. Just as we thought we would have a smooth start to the day a ski binding broke on that first, steep slope. Not wanting to have everyone wait at the bottom of the hill, I sent the group on their way and headed back to Camp 10 with Will Jenkins and his broken binding. Luckily, the binding was fixed quickly and we skied back down the hill. I remember being a student on JIRP and never wanting to be behind the group. No different than I, Will cruised ahead of me and soon we caught up with the others. As we traveled up the Taku Glacier towards the Matthes Glacier, we took many breaks to adjust our gear. It is not always obvious how to dress for travel on the glacier. The effect of the sun heating your body is amplified by the solar radiation that reflects off the glacier. Naturally, skiing with a big backpack keeps you toasty as well. On the other hand, there is the massive body of snow under your feet and the cold katabatic winds that cool you off as you ski. Katabatic winds are created by cold air flowing from high to low elevations on the glacier, and can really chill you on a hot summer’s day. Depending on the combination and prevalence of these factors, people have to change clothes constantly. The other challenges are hotspots and blisters. As potentially day-ruining afflictions, these need to be addressed immediately. During the breaks to bandage foot sores and adjust outfits, we also snack to keep our energy levels up and joke together as we rest our feet for a little while. When I was a student I skied the traverse in a whiteout, so I couldn’t see anything other than the ski tracks from the person in front of me. The staff member leading my group told us about the views of Devil's Paw and the Storm Range, but we could only imagine them. Coming up the trail to Camp 18 this year we were all captivated by the stunning ridgelines and mountain glaciers set against the backdrop of the blue, blue sky and did not have to rely on our imaginations. The group slowly rising over the final crest of the Matthes Glacier headed towards Camp 18. Photo by Sarah Bouckoms. As with many things in Alaska, the size and scale of icefield features is deceiving. Setting small personal goals is both rewarding and challenging on such a long ski trip. Promising yourself that you will eat that chocolate bar once you crest the next hill can mean waiting an hour instead of the 20 minutes you were planning on. However, when you finally stand on that hill enjoying your chocolate bar and take in the views offered by the massive slope you just conquered, you can be all the more content with reaching your goal. Some of the students started inquiring about the location of Camp 18 and although I can point out the peaks surrounding the camp, it really takes the whole day for the scale of the journey to really dawn on them. As the group crested the last hill of the Matthes Glacier, we could finally see down into the basin alongside the daunting ridge of the Storm Range. Huge black rock faces towered above us as we pushed through the remaining two miles to camp. The sun was setting behind this ridge and the soft snow froze over, creating a fast and slick surface for our skis. As we neared our destination, the Camp 18 buildings glimmered in the last sunlight, perched high on the nunatak. The final push to Camp 18 offered a view of the mighty Vaughan Lewis Icefall. The top of the icefall billows down a ridge where it breaks up into large crevasses. These crevasses stretch, become bigger, deform and transform into even larger crevasses. When these start to collapse due to the steep slope they are passing over, the icefall really shows that it is in slow, albeit chaotic motion. As my group crested the hill and we started the final downhill glide into Camp 18, the grandiose Gilkey Trench opened up before us. Only as we skied the final quarter-mile to camp did we really see the backdrop which is the surroundings of Camp 18. After 11 hours skiing uphill on the glaciers leading to Camp 18, the group made it just in time for a sunset over the Gilkey Trench. Being back at this magnificent Camp after a long day of skiing is just the reward I was hoping for. The real treat for me as a staff member was to be able to lead first-time JIRPers on this trip, to one of the most beautiful spots I have ever been to. The students were excited and positive all day, but what they saw upon arrival exceeded all of their expectations. Even I who knew what was in store was in wonder at the realization that this place is still here, that it is real, not just some past dream. I felt like the mediator or the guide who took the students to this place and when we arrived I could just sit back and smile as I watched them explore their new home, giddy with excitement. After a long day of skiing from Camp 10 to Camp 18, the sun sets on the glaciers and peaks of the Gilkey Trench. Photo by Sarah Bouckoms.